Accessing and activating your free software is as easy as registering your product on the Numark website. We’ve put together a walkthrough video which takes you step-by-step through the registration, download, and activation process for your included software. Can I cue through my headphones while I’m playing music through the main output? Connect headphones to the headphone output on the Party Mix controller. 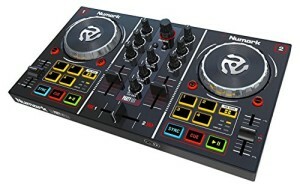 When launching Virtual DJ LE, be sure to select ‘Use Soundcard’ to auto-setup the Party Mix Hardware, or select Party Mix in the software under Config > Controllers..
To send a cue signal from a deck to your headphones, press the PFL/Cue button to send your channel’s pre-fader signal to the Cue Channel for monitoring. The Cue Mix knob adjusts the software’s audio output to your headphones, mixing between the Cue Channel and the master output.